Posture is the positions we adopt during everyday activities or rest such as standing, sitting, sleeping, and working or during sport. Ideal posture involves a minimal amount of stress and strain on the body and helps us to move easily and efficiently. It protects the supporting structures of the body against injury and progressive deformity. It is dependent on a multitude of factors including pain, emotions, your body structure and composition and body awareness. Physiotherapists are very good at observing and analysing posture and how faults could be contributing to your pain or injury. We will be observing how you sit in the waiting room or walk into the treatment rooms. We will identify any tight or weak muscles or joint stiffness or hypermobility that may be causing you to maintain a poor posture. Even if you do not currently have pain or dysfunction, we can identify faulty postures or movement patterns that may cause problems in the future and then dicuss ways to correct them. We will offer advice regarding correct sitting and standing positioning or moving and handling techniques. You may require advice on the set up of your computer and work station or on everyday activities such as gardening or driving or playing your sport. Pain and dysfunction can develop as a result of poor postures in sitting. As many of us sit for long periods in front of a computer at work this can have serious implications over the longer term and can lead to pain and dysfunction particularly in the neck and lower back and sometimes leading to nerve pain down the arm or the leg. 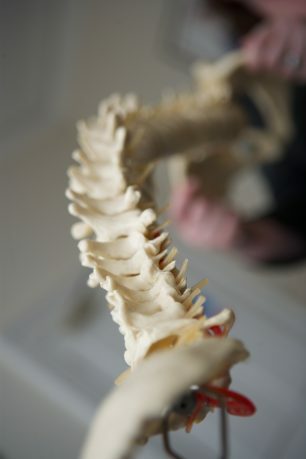 It is not easy to correct bad postural habits as they tend to be much engrained. However, the first step is identifying them; the second step is correcting them and the final step is to reinforce the correct pattern by repetition.